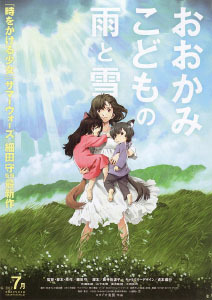 The Wolf Children Ame and Yuki (trailer 1 - 2) is a 2012 anime film directed by Mamoru Hosoda. Unlike his 2009 Summer Wars, this movie is very slow, introspective, and somewhat tragic. It might appeal to a small subset of furries, but its furry elements are underplayed and it may not have enough animal content to hook us as viewers. Transforming on full-moon nights and attacking people was just a legend. ... My father was a descendant of the Japanese wolves, that went extinct about 100 years ago. The last being that inherited a blood mix of humans and wolves. His parents told him, when he was still very young, the history of their family's destruction. They told him that the truth should not be revealed, and died after. He was then left in the care of relatives that knew nothing about it, faced many troubles and grew up into an adult. He got a driver's license and moved to the city to look for a job. Hana and the werewolf move in together and have two kids. Yuki (a girl) and a year later, Ame (a boy). Shortly afterwards, the werewolf accidentally dies while out hunting, and Hana decides to move into a rural area to allow her kids to grow up in safety. They've both inherited their father's shape-changing ability, but due to being toddlers, they have no impulse control, so it's difficult to hide their nature in the city. Furry transformation fans will be disappointed. There's a single slow TF scene when the werewolf first reveals his secret to Hana, and it's restricted to a head-shot. For the rest of the film, all the other changes occur in the blink of an eye, off-camera or are momentarily obscured by bushes, snow, billowing curtains, etc. And in the tradition of many anime films, it's the backgrounds that receive the most artistic attention, along with long, slow still shots, to save on animation time. The main foreground characters are rendered with much simpler lines and colors, and while this makes them easier to animate, it makes the furry designs rather boring. The kids spend most of their time in human form too, so getting to see them as wolves is fairly rare. Even the artistic backgrounds fall short – several look like the studio relied on photographs and live video footage, and tried to hide it using image filters. 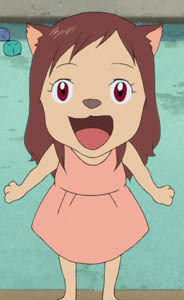 The film is narrated by Yuki, who is essentially telling Hana's life story to the viewer. So it's more a tale about a single mom trying to survive. The wolfishness of her two kids is simply an extra source of potential stress; the differences between human and animal nature are not explored in any significant way. It's a gimmick, having to hide their supernatural forms from their neighbors. Instead what we mostly get is a contrast in human personality types. Yuki is an energetic, extroverted spitfire with an appetite. Ame is introverted and timid, and even after he finally gains self-confidence, he gets increasingly moody and emo. Yuki wants to be socially accepted in grade school, so she tries to act more traditionally "girly" and hide her wolf heritage completely. Ame, on the other hand, doesn't enjoy school, and spends more and more time in the woods, eventually abandoning his family completely to become a local animal guardian, almost breaking his mother's heart in the process. He's the most "furry" character in the film, and sadly the most annoyingly unsympathetic. Wolf fans may enjoy how he embraces his inner self, but I personally felt the way he left his family behind was cold, very cold. The film's ending tries to be vaguely upbeat in a Japanese way: everyone's comfortable with their life choices, but with gaping future plot holes. Yuki leaves home to go to middle school (but what will happen if she ever has kids? ), Hana is apparently managing to survive in the country (but how did she explain how one of her children went missing? ), and she enjoys occasionally hearing Ame's howling in the distance (where he will die alone, because there are no more wolves). So yeah, I'm over-thinking it, but this wasn't exactly a happy film for me. Positives from this film? Yes! The scenes of the kids letting their wolf selves out are simply adorable, acting like crazy puppies. Seriously, if some furry fan would take the time to cut the film down to just those scenes (and there are a lot them, because huge chunks of the movie are montage sequences), I guarantee it would make you smile. The current problem is having to sit through the rest of the film to see them, what with all the long introspective bits and Ame's moodiness. 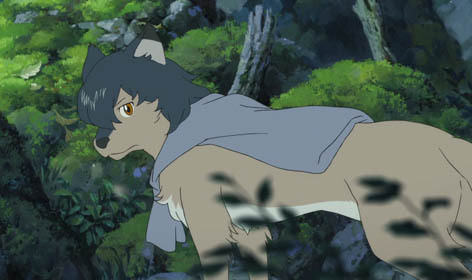 Another very powerful sequence, at least for people with wolf/therian leanings, is from about 1:18 to 1:22, in which Ame is led through the forest and across the mountain by his animal guardian teacher, a fox. Generally speaking, I think this anime film might resonate with a small percentage of people in our fandom, but overall I think the pacing is a bit slow and the furry content isn't explored anywhere near enough to be worth a second viewing. I loved this - I thought it was sweet and simple, though I did end up feeling terribly sorry for the mother. I decided to see this myself tonight. I agree with most of the technical criticisms, but I see things a little differently with regards to the kid's personalities, and the overarching theme of the movie. What starts off as a story about Hana becomes one about her children, and the choices they make. Both Ame and Yuki must decide how to live their lives, and conquer the forces restraining them. That is the true transformation on display in this film - from childhood to adulthood. Sure, it's fun to see the pups running around, but it's what's going on inside that counts. Ame has to leave. It is hard on Hana because she has been holding him back, perhaps fearing that she has not done all that she can for him. Yet it's only by rejecting humanity that he can become whole. She is happy because both of her children grew up into what they wanted. Maybe she'll have to host puppies on the farm a few years down the road, but at least they'll grow up in a family which understands them. As for the fox, I'm one of the 39% of furries who would consider becoming 100% non-human, and that sequence was very appealing. True, it does slowly shift from Hana's story to the children's experiences as the film moves on; part of me was wondering about the Japanese view on fitting in and social conformity. What works well is that the choices that Ame and Yuki both make - you can see exactly why, over time, they make the decisions they do, ultimately based on their underlying personalities, it's very much a character film by that point. I don't know if Yuki so much gets-the-guy as makes-peace-with-the-guy, the ending's so vague about that. Aha, it is a good sequence isn't it? Plus Ame's howling at the ending after climbing the mountain, close to the end of the film. "Ame is not just a moody human - he is growing up into a wolf, having accepted his "true nature" after a spiritual experience." Except he's *not* a wolf. Neither is Yuki. They're also not entirely human either. Which is the problem I had with this movie - *neither* child learned to live with who they ARE - they both chose one side of the coin and abandoned the other. But in the case of Ame - he also abandoned his sister and his mother - which isn't actually very wolf-like at all! Wolves tend to stay together in families. When the pack gets big enough - or there are too many dominate females, the pack splits off splinter groups of one more wolves (typically the betas who end up causing problems for the alphas) who then go off to found new packs. In the end, this movie has the exact same flaw as Brother Bear... it's supposed to be a morality play but ends up essentially presenting irresponsibility as a positive thing. Their father tried to live in both worlds, and died trying. Perhaps it's better this way. Ame tried to get his sister to join him learning the ways of the wolf, and when there was danger he told his sister to stay home: she ignored him both times, and took several steps that resulted in her staying away for longer than she otherwise would have. She also ended up going off to a boarding school. The Japanese audience may have a different sense of morals. Their society seems very big on dedication to work. Yarst! I probably will not be able to see this movie until it becomes available on home video. Well, you shouldn't have to wait too long - the Japanese Blu-ray/DVD versions are already out, and Funmation announced plans for a dubbed version last October. Dubbed version, phooey! What about a subtitled version? It's a dual-language DVD. I imagine you could combine the Japanese language track with English subtitles. I agree that if someone is looking for a 100% furry movie, they won't find it in "Wolf Children." Still, I hope that it would appeal to much more than a small percentage of furries. For one thing, for a "non-furry" movie, it's still pretty darn furry. You get plenty of scenes of the characters in various stages of wolf-form, as well as a few scenes of non-anthropomorphic wild animals. Even when the "wolf-people" (the children and the father) are shown as humans, you still know that they have this animal part of themselves inside, which is something a lot of furs could relate to. More than that, the themes of the movie--parenting, childhood, growing up, and finding out who you are--are pretty universal I think. I thought the half-wolf/half-human concept was handled imaginatively, bringing together issues of family heritage, difficulties in fitting in with peers, frustrations of child-rearing, dealing with conflicting parts of your personality, and more. One person's gimmick is another's symbolism, I guess. Finally, just a note on the artwork--the director has stated (see his Q&A at the NY Children's Film Fest, which is up on YouTube) that everything in the movie was hand-drawn. For all I know they may have used tracing for some of the scenes, which is not uncommon in animation, but it's still pretty impressive IMO. They had some of the best artists in anime working on this film, including several from Studio Ghibli, and personally I thought the artwork was beautiful! 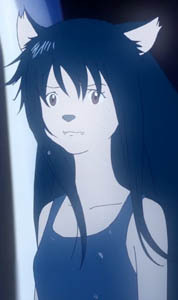 Wolf Children: Ame and Yuki will be showing at the Dallas International Film Festival on April 8 and 13. I think tickets are $10. Funimation has a blog post listing all of the theatrical showings; in addition to the ones in Dallas, it's also showing in New York City (today, Sunday the 24th), and will be showing in Santa Monica, CA and San Diego, CA in April. I remember someone on this site linked to this review, so I had to see the film. As a furry, an animation lover, and as a transformation fan. Yeah, lack luster transformations, yeah typical anime money saving stuff, but the film was good! I actually cried the more I thought about it, and looking back I think Ame was way too cold, that really bugged me. Especially with my personality type where I have to know what everyone is thinking or feeling, so that killed me inside. The loose ends were a bit annoying also, and I don't think I'll be rewatching it, even if it was emotional. But since I'm working on my own movie right now, this is a good film to get ideas from for what and what not to do. I don't regret watching it, it wasn't that bad!